This past Friday the Supreme Court agreed to consider the legality of online-video service Aereo. This case has far-reaching implications for both consumers and media companies and is sure to be a big story in 2014. In order to give you an understanding of how Aereo works, I’ll share my experience. I subscribed to Aereo 6 months ago because I was paying too much for TV to Time Warner, and liked the idea of trying something new and potentially disruptive. I gladly pay the $8 subscription fee. The most common channels that I watch are Bloomberg, CBS, Fox, ABC, NBC, and PBS. I watch Aereo on my TV, streaming from an iPhone or iPad to Apple TV via AirPlay. Since there’s no Aereo app for iPhone, I use Aereo’s website in either the Safari or Chrome browser. Video plays in QuickTime and from their I can connect to my Apple TV using AirPlay, since I’m always on the same wifi network. The fact it takes that long to explain how to watch Aereo is problem number one. In terms of being easy to use, watching Aereo today on your TV is simply not as easy or reliable as when you pay for cable and get a cable box. You have to rely on your iPhone, AirPlay, Apple TV, and more software/hardware combinations to get reliable service. This means there’s multiple places where something can go wrong, resulting in a negative viewing experience. Reliability problems are especially bad with Aereo, as we’re used to having very reliable TV. Wouldn’t you be surprised if your TV froze mid-game? Sure it happens, but it’s not a frequent occurrence. Not so with Aereo. When Google, Yahoo, and Facebook present a unified front in a case set to go to the Supreme Court, as they are in support of Aereo, something big must be at stake. This case cuts to the heart of the web, and Aereo could end up being a proxy in the high stakes battle over content ownership on the web. Google themselves, from their search engine to YouTube, has a lot in common with Aereo. In fact the big broadcasters were saying the same thing to YouTube they are to Aereo – that they steal their content. From YouTube and Aereo’s point of view they access and deliver content to consumers in a novel way. There are billions of dollars are at stake. Aereo is different in several key ways – first, Aereo is a subscription service whereas YouTube makes money through ads. There’s also the fact that YouTube never streamed live TV, as Aereo does (no matter what legal argument they use). Live TV or DVR service? In the eyes of the law, a key distinction in determining the legality of a service like Aereo’s is if the company is streaming live TV or a recorded copy, as in a DVR service. This decision is likely to be a key part of the Supreme Court case. In 2006, the networks sued Cablevision over “Network DVR”, saying they were illegally delivering their copyrighted content to Cablevision customers. The networks won the initial court case, but in 2008 New York’s Second U.S. Circuit Court of Appeals intervened and ruled that Cablevision could continue to offer Network DVR. Their logic was that each customer was accessing a unique copy of a broadcast, not watching live TV and therefore not breaking federal copyright law. This set a precedent, and allowed Cablevision to continue offering customers Network DVR. Other networks soon followed. 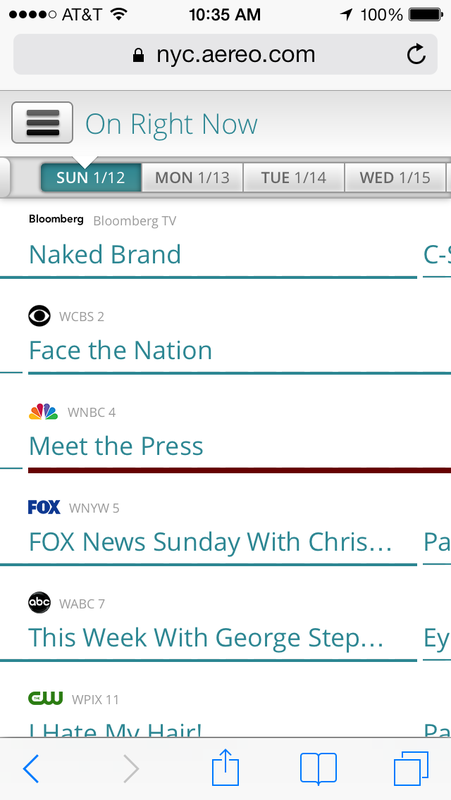 It seems to me that Aereo wants consumers to view them as a way to watch live TV, and not a cloud-based DVR service. This is a clearer message to get through to viewers and the market is much bigger – almost everyone watches TV. Despite the legal wall Aereo builds around their business, put plainly I think consumers see Aereo as a live TV service. The DVR functionality is viewed as an added benefit. But it’s still early and there’s a lot of time before any Supreme Court decision. It’ll be interesting to see how this plays out. I’ll be following this case closely. Next post: Apple on the defensive?